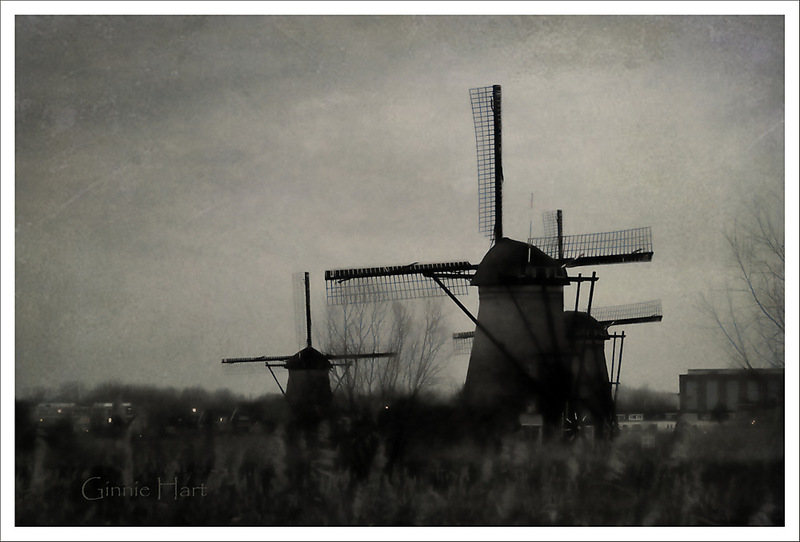 There are 19 windmills at Kinderdijk, NL, making the groupings endless! Then this will be a long and subtly varying series, Ginnie...bring it on! Ginnie Hart: Actually, Ray, there's only one more in this series, so you can start gearing up for something else. Love windmill Friday! And that soft focus! Ginnie Hart: Thank you, Robin. Only one more in this series and then it'll be a "something else" Friday. Ginnie Hart: Most kind of you, Peter. One more in this series and we'll then move on...! Ginnie Hart: The lights are on and everyone is now awake, let's hope. Off to work they go, indeed. Windmills are so fascinating Ginnie! Superb image. Ginnie Hart: Yes, they are, Richard. Thank you. Ginnie Hart: HA! That's one way to put it, Michael. Ginnie Hart: One day maybe you'll get a pair of wooden shoes, Elaine. Easier to carry around than a pair of windmills. Ginnie Hart: Very kind of you, Bill, because neither do I (but then, we're both Gemini!). Only one more in this series and very different from the others, so we can all move on to something else. Never bored with things of such beauty I can't join in with a Windmill Friday series; my colelction is 0. Ginnie Hart: Glad you're never bored, Alan, because after 6+ years I'm still not bored by them. Only one more, though, in this series before I'm back to Boat Friday or who-knows-what. I sure that that will not stop you Ginnie, I fact, not exactly endless. But a great challenge. Ginnie Hart: HA! Well, even I would get tired of them after awhile, Chad, I'm sure. Ginnie Hart: Thank you, Pat. You'd love this place. I really love this one, Ginnie. Like last weeks, there is a bit of a charcoal effect. Ginnie Hart: You remember well, Mary. Thank you. Only one more image in this series, so at least you know this isn't endless! We have some windmills here, scattered all over some really odd places. Ginnie Hart: For all the times I've been to England, I don't think I've seen one windmill, LC. Hmmm. And it's not that I'm not looking, of course! That is a very nice 19th century photograph. Ginnie Hart: Thank you, Michael. It's so fun to step back in time with these old mills! Ditto all my previous comments about this place Ginnie. Ginnie Hart: If it weren't for the wind....! i am quite content to look at your windmill shots, Ginnie. Ginnie Hart: You're a sweetheart, Ayush. If you haven't yet been to Kinderdijk, we'll take you when you come back. Ginnie Hart: Thank you, Cherry. Do you think you and Mr. C would ever want to visit our neck of the woods for vacation-time or a long weekend? If so, just let us know. We were sorry that you were in England when we visited Belgium last year. Ginnie Hart: Well, please know that if ever we're able/free, we would love to have you here. Our senior-living complex has 2 guest rooms across the courtyard from us, one of which we could always reserve for you. This is a pretty full year for us thus far (unless you're talking about Sat-Mon weekends, when Astrid is off), but you never know. Just let us know....!